Property 1: **Lovely Salt Lake suburban Ski/Vacation home! Property 2: Ever dream of sleeping outdoors in a tree house? Property 4: FLY AWAY HOME- Where you get FULL TWO-STORY HOME TO YOURSELVES! On the Mountain Top! You found the right place! Property 7: On the Mountain Top! You found the right place! Large Grantsville hm, perfect for Large groups! Property 21: Large Grantsville hm, perfect for Large groups! Property 22: NEW! 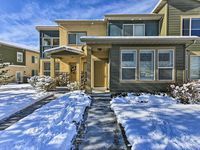 Lavish Townhome 20 mins from Salt Lake City! Crows Nest, Just a great house! Property 23: Crows Nest, Just a great house! Relax in your own private infrared sauna after a long day of skiing. Property 26: Relax in your own private infrared sauna after a long day of skiing. 5 min from Airport, 10 minutes to downtown, 26 min to Park City skiing, Clean! Property 30: 5 min from Airport, 10 minutes to downtown, 26 min to Park City skiing, Clean! We have been in the condo of Helene during 2 weeks in January for skiing. We have loved our stay. The condo was quiet, clean, well equiped for all you need for cooking, comfortable bed, fast internet, HD TV. Helne responded well at our needs. We recommand ! 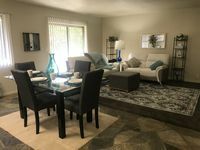 This place is a nice, newer town home within walking distance to dining options, shopping and entertainment. The space is cozy with the bedrooms upstairs and the living/dining/kitchen area downstairs. Having the one car garage was also a huge bonus. It is a new rental so they were still dialing in some details like setting up the wi-fi but the owner/rental company was very responsive and I would definitely stay here again if I was in the area.